Among the employees was John T. Hill, the first paying teller. Hill’s exemplary performance was noticed. He was a young man who would go places within the bank. By 1870 the bank’s growth and reputation required a new building. Two lots were acquired a block north on Broadway at Nos. 407 and 409 between Walker and Lispenard Streets. A grand stone building was erected in the highly-popular French Second Empire style. It would resemble, in a much scaled-down version, the mammoth City Hall Post Office which was just being planned. By now the young teller John Hill had been promoted to cashier. Offices in the building were leased to the National Revenue Reform Association, one of several reform groups that sought to overthrow the corrupt Tammany Hall. 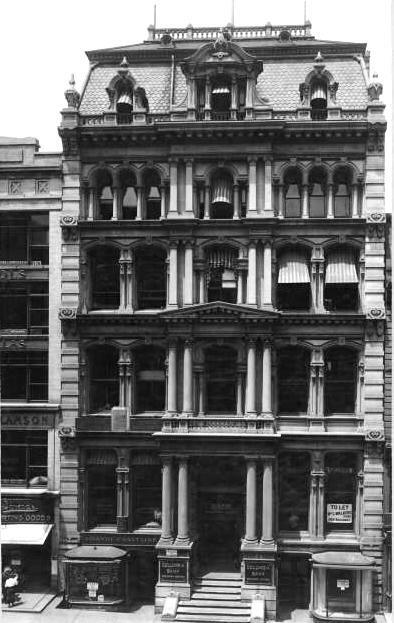 The New York Tribune reported on September 6, 1871 that “two or three Reform Associations, led by prominent and active citizens of unquestioned character and professional standing, also gave the ‘Ring’ much uneasiness, and these having now combined are prepared to give it a great deal more.” The National Revenue Reform Association offered the use of its rooms as a headquarters for the anti-Tammany movement, although the offer was politely declined. In 1874 Thomas A. Vyse resigned from the presidency of the Ninth National Bank, focusing his energies on the firm of Vyse & Co. (It was around this time that the former teller, John Hill, received yet another promotion.) Prior to his resignation, Vyse borrowed $475,000 and gave as security a mortgage on property he owned. He requested that the transaction not be recorded. The seemingly shady deal came to light when, early in 1875, Vyse & Co. failed. Creditors scrambled to claim their portion of the assets but Ninth National, which had never documented the loan, had a problem. “Under these circumstances the bank, it was stated, would be a loser to the full amount of the loan, and in consequence be seriously embarrassed,” reported The Times. While the bank was patching its bruised public image, it continued leasing offices on the upper floors. The same year C. S. Morton, an agent for the freight railroad The Canada Southern Co-Operative had his headquarters here. By the time that the Mercantile Benefit Association moved in, one-time teller John Hill was President of the bank. Hill became the bank’s third president in 1877. Things went well until his wife’s wealthy spinster aunt, Eliza Dayton, entrusted her finances to Hill’s brother, Charles. Unfortunately, Charles was not the best financial advisor and on a single occasion lost $68,000 of Dayton’s money. In 1884 Eliza Dayton’s estate had suffered loses so great that Charles Hill committed suicide. John Hill promised to restore the fortune of his wife’s aunt. The façade of the upstanding and honest bank president would crumble upon his death at the age of 55 in 1891. To restore Eliza Dayton’s extensive financial loses and to continue his comfortable lifestyle John H. Hill had constantly embezzled from the Ninth National Bank from 1884 until his death. When a borrower would repay his loan and receive his collateral, Hill would pocket the money and the bank’s books would show the loan still outstanding. In place of the collateral he would put an envelope with the records of the loan. When a bank examiner would visit, he would transfer securities into the loan envelopes until the investigation was completed. The president who had risen from teller had robbed his own bank of $400,000—nearly $10 million today. The bank, which was responsible for the stolen amount, offered a $500 reward for the arrest of the 30-year old forger. In November 1901 the bank merged with the National Citizens’ Bank. That bank had been founded in 1858 “during the California ‘Gold Fever,’” according to King’s Views of New York City. The two competing banks were now one and Ninth National gave up its familiar name. The arrangement would not last long, however. Less than three years later, in March 1904 the National Citizens and the Central National Bank consolidated. Once again the bank’s name was changed; but this time the merger would mean leaving the building at Nos. 407-409 Broadway. By August the Netherland State Railway of Holland had leased the front portion of the building vacated by the bank. The firm was still in the building when an advertisement in The Sun announced the upcoming auction of the property on April 19, 1906. It was purchased by Olin G. Walbridge. Walbridge had little time to develop his new real estate. He died within the year leaving an estate of $326,236 including the old bank building on Broadway. His will divided the estate equally among his various heirs, resulting in a two-year court battle among family members that finally resulted in son Francis Walbridge acquiring the building. Walbridge was successful in returning the structure to its original banking function with Columbia Bank taking over the business floors. The same year that Francis Walbridge died in 1917, however, the bank opened a new branch at No. 415 Broadway and discontinued business at Nos. 407-409. Five days after the announcement that the bank was leaving, the building was sold again at auction to Max Marx on May 6, 1917. The old Ninth National Bank building would never again be used as a financial institution. 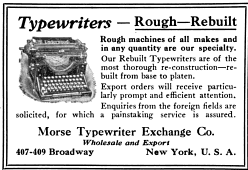 Instead it became home to firms marketing the up-and-coming typewriter. The Irving Typewriter Company established its offices here, as did the Morse Typewriter Exchange Co. 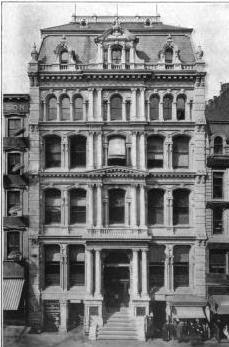 In July 1924 Marx sold the building to Frank Hillman for about $160,000. The jazz age had roared into New York and the Great Depression was still years away. Popular taste turned to sleek, clean lines and the Victorian dowager at No. 407-409 Broadway was decidedly out of style. Although the building was no longer fashionable for a bank, the location certainly was. On May 8, 1927 The Manufacturers Safe Deposit Company announced it would open a branch on the site. Within five months the old Ninth National Bank was gone and in its place was a new modern two-story building designed by A. F. Gilbert. Thank you, Mr. Miller, for this interesting article. My Great Grandfather Thomas A. Vyse, yep, president of that bank, passed away 100 years ago today. I have been delving into his history for the past couple of months and this is the most complete article I have found to date on the Ninth National Bank. I have a couple of questions, though. Was Mr. Vyse the original president of the bank and one of the original founders? If you don't know the answer to that one, I'd appreciate a referral to a source. I'd also be interested in the History of Vyse & Co. as I've come up dry in that area. I've already plumbed the New York Times. Any other ideas? Thanks! Vyse & Co. was a manufacturer of "straw goods" and in 1874 won a bronze medal for sponge carpet mats at the American Institute. Although the firm failed within a year, it was back in business making straw women's hats. 1870 Census record shows Thomas Vyse (transcribed "Fyse") with a summer home in New London, CT, and a huge number of servants. Real estate valued at $500,000.